Hayhurst, Markus Plötz, Dean Gilbert, and Ross Watson and published by Ulisses Spiele. Torg is an all-encompassing, sci-fi fantasy Earth setting similar to the size of Rifts and Shadowrun. It features an alternate, near future of Earth where high-tech alien beings, called High Lords, are taking over Earth and brave warriors, called Storm Knights (i.e. the PCs), must rise-up to stop it. Torg was originally released in the early 90s and Torg Eternity is effectively the second edition supposedly featuring streamlined rules (honestly, that might be a design goal, but if it’s an improvement or not is at the whims of the beholder). However, unlike other Earth-spanning settings, it is not homogeneous in that each High Lord brings a different realm, called Cosms, to Earth. The realms include low fantasy, pulp, prehistoric, and cyberpunk, just to name a few. Thus when you move from realm to realm, the look and feel of the setting will not be the same. Torg Eternity uses a d20, chart-based roll-over system where whatever you roll on the d20 serves as a bonus (according to the chart) that is added to your traits to determine if you meet or beat the target number. How well you beat the target number may also determine additional aspects to your action, based on the action being performed. Base attributes define each character, skills determine what they specialize in, and perks provide situational bonuses that make them further unique. 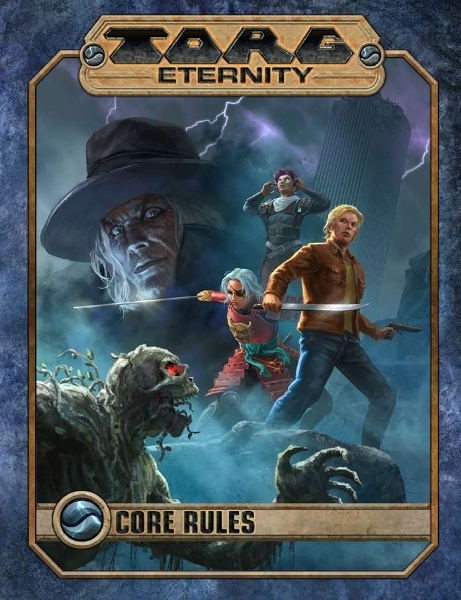 However, the Torg Eternity core rules are designed to be heroic and cinematic by adding a bit of drama in the form of cards, called the Drama Deck. These cards determine initiative and additional aspects of the encounter that change the flavor of the conflict. There are also additional cards that further promote the heroic and cinematic form of the rules, but we won’t get into too many details here. If you strip Torg Eternity down, what you really find is a multi-genre setting wrapping around a generic universal game system. Whereas most generic universal game systems (GURPS, Savage Worlds, Basic Roleplaying, Entropic Gaming System, etc.) 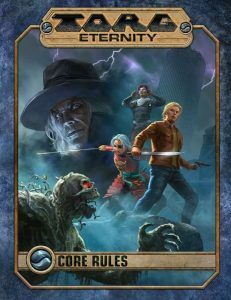 are designed to accommodate pretty much every genre, Torg Eternity actually provides a setting that covers multiple genres to exercise that system and tie it together with a setting that has purpose. You could literally strip out the setting and keep the mechanics, but then the setting and the multiple genres no longer have purpose. That is possibly one of the greatest appeals to Torg Eternity is its flexibility. But the book itself? I have a bit of a problem with it… If you look through the credits, you will note some familiar names that are part of the Pinnacle Entertainment Group development and publication team of Savage Worlds. If you ripped of the cover of this book, you would almost think it’s another Savage Worlds book published by Pinnacle Entertainment Group itself. It is formatted the same, it uses similar generic universal mechanical styles, it offers the same advanced play situations, and even the monster stat blocks look exactly the same. Although the book is published by Ulisses Spiele and has nothing to do with Savage Worlds, it truly suffers from a lack of visual brand recognition (excluding the logo). It looks and feels too much like a Pinnacle product (even the artwork). Thankfully the base mechanics (the conflict resolution using the d20) differ. Torg Eternity is not a character-centric RPG. Every character is a Storm Knight, but that is only a colloquial term as they are effectively whatever the player wants that character to be. However, the focus is more on how the character interacts with the setting and how the dramatic aspects of the system affect conflicts (think of it as fate intervention, for good or bad). The players then have cards that can overcome fate/karma/whatever, focusing on the heroic and cinematic aspects of the RPG. It’s not so much that the characters aren’t important, but rather gameplay focuses more on if the setting wins or not. This is very similar to vanilla epic fantasy, military sci-fi, and other genres that have grandiose settings. Torg Eternity is definitely not an RPG that will appeal to everyone. It has to be the type of gaming experience your group is looking for as it’s very likely a long-term commitment. If this type of multi-genre, grandiose setting is what you’re looking for, then I think Torg Eternity is an RPG you should check-out.